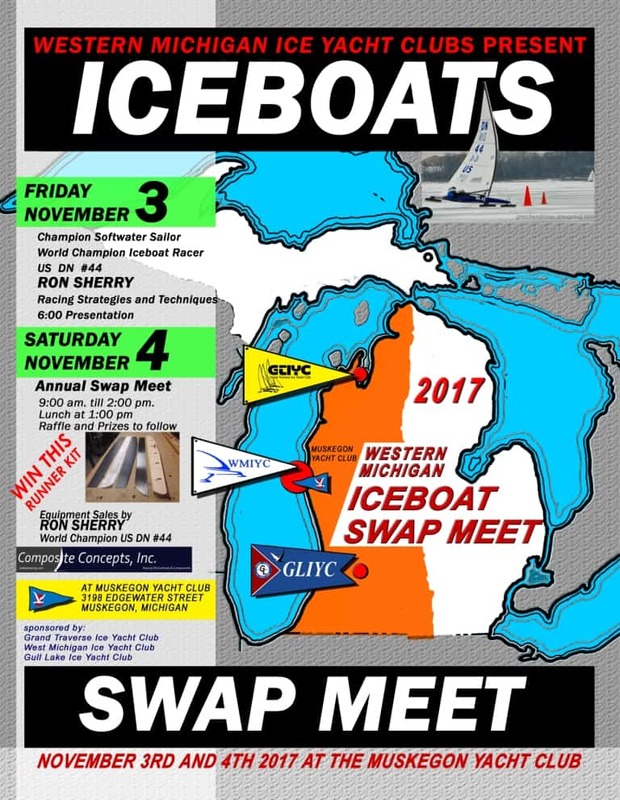 This year the Gull Lake Ice Yacht Club (search Facebook: Gull Lake Ice Yacht Club) will be combining with the Grand Traverse and West Michigan Ice Yacht Clubs in sponsoring and putting on the annual 2017-18 ice sailing season’s opener Swap Meet in Muskegon, MI. If you are coming in from out of town we have made special arrangements with the Baymont Inn and Suites, (231) 798-0220, here in Muskegon on Friday evening for rooms with two (2) queen sized beds for $67.99 pus tax. When checking in tell them you are in town for the Western Michigan Iceboat Swap Meet. This year’s event will be held at the Muskegon Yacht Club (MYC) located on the southwest end of Muskegon Lake. 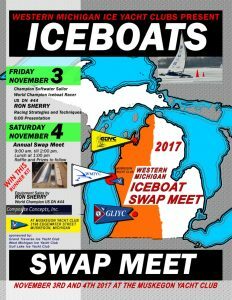 What has in the past been known and referred to as the Gull Lake Swap Meet held at the Gull Lake Country Club on Gull Lake is this year renaming itself as the “Western Michigan Iceboat Swap Meet”. “Nearly every winning boat sailed a similar course to Dragon, staying close to the Florida reefs for relief from the swift-moving current of the Gulf Stream for as long as possible. 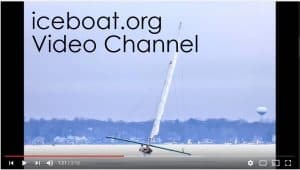 Despite sailing one of the lightest and smallest boats in the race, the Michigan crew aboard 35-foot Chico 2 finished fourth over the line and first in PHRF B Class thanks to strong crew work and near-flawless navigation. “This is my first race to Havana, but I’ve run literally two months worth of navigational simulations of the race at home on the computer,” said Tom Anderson, Chico’s navigator. “The real deal was quite a bit wetter, but thanks to the preparation, it was always familiar, and the answer was to avoid the deep water and push the boat hard along the reef.” (excerpted from Sailing Anarchy). This presentation should be interesting to anyone interested in sailing! This presentation will be open to those “ice sailors” present on Friday evening, as well as any MYC “soft water sailors” who might be present at the club that evening. Everyone is welcome! For anyone planning on attending, we expect to start Ron’s presentation sometime around 7:00 pm in the “Spinnaker Room”. MYC’s kitchen will be open to any “ice sailors” on Friday evening in order to order from the open menu. Any alcohol, however, will need to be purchased via a MYC member, several of which are active members of the WMIYC. There will be a luncheon buffet available at noon on Saturday included in the Swap Meet fee of $15.00 for which you will receive a “SINGLE” lunch ticket. For current WMIYC members, and any one else attending the meet who desires to become a new member of the WMIYC, in addition to lunch you will also receive a one (1) year membership to the WMIYC. Also included in the $15.00 fee you will receive one (1) “DOUBLE” ticket that you will use in bidding in the “Silent Auction” for some pretty nice gifts that will be available. Additional tickets for the “Silent Auction” will be available for purchase @ $1.00 ea. or six (6) for $5.00. You’ll likely want to either buy as many as you want, or more than you can afford, when you see what is being auctioned off! We will also be holding and selling tickets for a “50/50 Raffle” with the proceeds going to cover Swap Meet expenses. During, or after, lunch we have suggested to Ron that he be prepared to present a brief technical presentation on DN rig tuning and blade sharpening basics. Please put this on your calendar and plan to attend. If you are not an iceboater please ensure you take a look at the iceboats and related hardware that will be displayed/traded/sold on Saturday! It is a great way to extend your sailing season here in West Michigan! It is also typically a great opportunity to get into the sport with an older boat at a good price! Check us out!